Yea Chess is a light portable chess game versus computer. The AI is powerful and you can set the skill based on your need, and it has a pretty simple user interface as well. Yea chess is portable, which means you don't have to install it. Just place the file in any folder on your local disk or even in a removable storage device such as USB flash disk. Then with a single click, the game will run just perfectly. You may need to create a desktop shortcut for a quick run. It also has the ability to save the game in progress, and then restart it again next time from the same position. 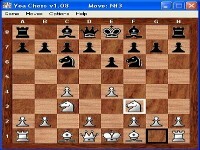 In brief, Yea Chess is a nice chess program, totally portable, and free. Play simple monopoly in which you must buy many properties to stay surviving on board.